Directory submission is one of the most powerful and popular type of SEO backlinks. It's a process of submitting your website links or URLs in the directories. Directory submission is one of the best strategies for our website to gain popularity on the web. 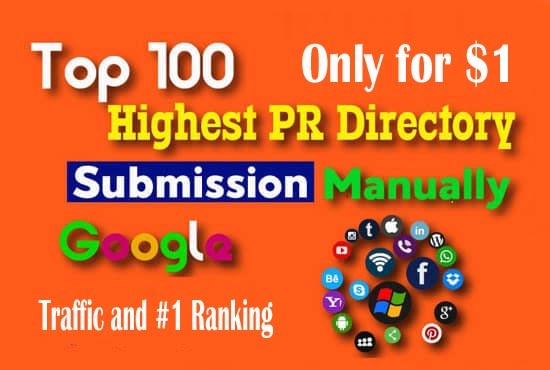 I will create high quality 100 Directory submission links for your website to increase organic traffic, backlinks and keywords ranking of on Google first page. Improve your website ranking in all major search engine first page. Increase organic traffic form search engine. Increase your website powerful SEO backlinks. Faster indexing your website pages. Increase more customers and sales. 100% Google panda penguin animals safe. DA 90 to 50 sites. Live & Waiting for approval links. It's one of the best Directory Submission services. High authority 100 Directory Submission is ranked 5 out of 5. Based on 1 user reviews.